A puzzling epidemic of teenage suicides is sweeping the town of Springwood. Young Kristen, who tried to slash her wrists, has been admitted to Westin Hills Psychiatric Hospital. Six other teenagers are in a special ward—all of them apparently suicidal: the fast-talking Kincaid; Will, who’s in a wheelchair; the quiet and gentle Joey; Jennifer, who wants to be a TV star; Taryn, a former junkie who’s been in and out of juvenile hall; and Phillip, a sleepwalker. Dr. Neil Gordon is perplexed by this motley crew of teenagers and their overwhelming fear of what seems to be a shared nightmare. No one has come up with any answers, but when Nancy Thompson joins the staff, things begin to change. A specialist in dream disorders, she was the only survivor of an earlier epidemic of suicides, and she seems to know things the other doctors don’t. She knows the kids are being tormented by the grisly spirit of Freddy Krueger, a child-murderer who was brutally burned to death by a vigilante mob several years ago and who is now wreaking his revenge on the children of those who killed him. 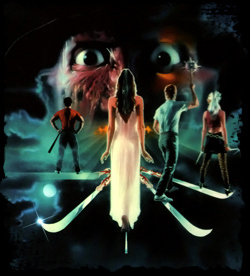 Her first night in the hospital, Kristen has a nightmare in which Freddy takes her to the house on Elm Street, where his old nemesis, Nancy, used to live. In the shape of a venomous snake, he is about to devour Kristen when she calls to Nancy for help. Miraculously, she’s able to pull Nancy into her dream and is saved. Group therapy sessions at the hospital are not going well. Nancy tries to convince the other doctors that the monstrous presence in the kids’ dreams is real, but they don’t believe her. The next night, Phillip falls asleep and sleepwalking under Freddy’s power, jumps from the hospital bell tower to his death. Next on Freddy’s hit list is Jennifer, who rams her head into the TV set after seeing Freddy’s face on the screen. Desperate to help the kids, Nancy tells Neil the truth; this time, he believes her. Together, they ask Kristen to help them by using her psychic gift and drawing all of them into the same dream. Through group hypnosis, they enter a dream state, but Freddy is too quick for them. He lures Joey away and starts to torture him. Suddenly the session is interrupted and Joey’s life is saved—almost. Furious with Nancy and Neil for their unorthodox methods, the hospital administrator fires them, while Joey lies in a coma. As Neil is leaving the hospital, he sees a mysterious nun and follows her into an abandoned wing of the hospital. The nun tells him the story of a young woman who, many years ago, was raped repeatedly by a group of criminally insane inmates in the now-desolate wing. The woman gave birth to a son; his name was Freddy Krueger. The nun, Sister Mary Helena, counsels Neil to use faith, not just science, to conquer Freddy, and tells him to bury Freddy’s remains in hallowed ground in order to break his murderous rampage. Nancy and Neil seek out Nancy’s father, Donald Thompson, who was one of the vigilantes who killed Freddy, and is the only person who can tell them where Freddy’s bones are hidden. He takes Neil to a deserted auto junkyard where they find the remains. In a desperate race against time, Neil digs a makeshift grave and gives Freddy the hallowed burial that will free him and his victims forever—but not before Krueger impales Thompson on the fin of a ’50s Cadillac. In the meantime, Nancy and the surviving kids decide to hypnotize themselves into the most terrifying nightmare yet. Grown even stronger because of his recent killings, Freddy preys on their deepest fears. Taryn and Will momentarily let down their guard and are killed. The remaining “dream warriors” save Joey from Freddy’s loathsome boiler room pit and escape, but Freddy is not through with them. Nancy sees the ghost of her father and embraces him only to find that Freddy has tricked her. As his horrifying form emerges from Thompson’s spirit, he buries his claw hand in Nancy’s stomach seconds before Neil, across town in the junkyard, buries his skeleton. As he does so, Freddy’s deformed body is shot through with light. His soul and the souls of his victims are free. Freddy Krueger is gone. The battle-scarred survivors—Kincaid, Joey and Kristen—stand next to their friends’ graves with Neil at their side. He sees the nun and follows her to a tombstone carved with the name “Amanda Krueger—her name in Christ, Sister Mary Helena.” She was the woman who was raped, he realizes. She was Freddy’s mother. Released from her nightly terror, Kristen visits Neil one evening. He is peaceful now, and anxious to go to sleep. Because of her psychic “dream” gift, she has made it possible for Neil to meet Nancy in his dreams, in a nice little house on Elm Street.